Imagine a car without power steering! Let’s just say, you’d never miss arm day. Power steering is designed to make steering swift and easy, with a hydraulic system that allows pressure to build up every time you turn the wheel, and then this pressure is used to push the tyres in the direction you’re turning. Unlike other systems in the car, you are always connected with the steering wheel, so it is understandable why a problem with the power steering could be a safety hazard. However, you will most likely notice if an issue occurs concerning the steering system, as you will feel the difference. Therefore, once you’ve acknowledged that there is a fault, it’s important to diagnose and fix it immediately, to avoid further damages to the system and to your wallet. In order to diagnose the problems, you need to have an idea of what they are and what symptoms your car shows to alert you, so have a read of some main ones we’ve compiled for you. Since we’re dealing with a fluid here, leaks are bound to happen at some point. Witnessing a leak under your car can sometimes trigger a leak in your eyes when thinking of how much the problem will affect your wallet. Besides the obvious sign of a leak being the red or brownish power steering fluid dripping under your car, you may also notice that your steering wheel feels stiff and hard to turn. If the leakage has drained most of the fluid, then you may even hear grinding noises when turning the wheel. What Should You Do? The important thing to keep in mind is that if you notice a leak, act quickly! Don’t leave it to the point where your power steering pump starts whining due to very low levels of power steering fluid. A common cause of the leak is usually a worn or fractured hose, however, if it looks fine on inspection, then it’s a good idea to check any connections to the hose, like clamps. If they both check out, then turn your attention to the power steering pump, specifically the pump seal, as it may be the source of the leak. In addition, your whole power steering rack should receive a thorough examination, as the leak could be originating from there. Commonly the rack will leak from either the centre main seal, pushing the fluid out from the gators on either end or it may leak from the top pinion seal. If you’re turning a corner and your car lets out a loud screech, scaring the hell out of you, then you need to consider having a look at your power steering system. These loud noises may suggest a slipping drive belt, meaning it may need to be adjusted or even replaced. As long as these noises are occurring without a leak, you may be able to dismiss the idea of a power steering leak being the cause. What Should You Do? You need to examine the belt for any visible injuries, such as cracks or missing pieces. If the problem is due to wear and tear, you will need to replace it. However, if it is due to it being loose and slipping, then you need to adjust it immediately, to avoid it collecting any damage that may lead to replacement. Have you ever had to summon hulk strength in order to get your steering wheel to turn? If so, then there’s a chance that it’s due to loss of power in the hydraulic assist. Now, a few things can cause this loss of power, two examples being low power steering fluid or a shortage of power steering fluid pressure. What Should You Do? Time to get your inspection specs on and have a close look at the power steering system! 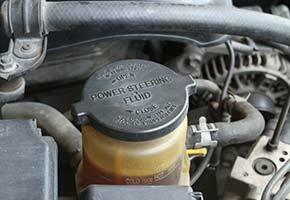 The easy part is to first check the power steering fluid reservoir, and ensure that there is enough in there. If you happen to find low levels of fluid opposed to the right amount that is usually situated in there, then you can safely assume you have a leak. You may think that all you need to do is top up the fluid and voila, you’re done! Unfortunately, you’ve only set up a temporary solution, what you need to do is find the root of the leak. If the fluid levels are actually fine, then you can consider the power loss of the hydraulic assist to maybe be caused by a lack of hydraulic fluid pressure. A lack of pressure in the system could be due to a leak, but otherwise may be more of a technical problem within the pump, such as the pressure plates within the pump wearing out. When looking at power steering problems, you may usually think of the cause being a lack of power steering fluid however, this problem is sometimes not directly related to that. Occasionally it could be, as the unit could be part-hydraulic & part-electric, like the Mini Cooper steering pump. But in this scenario imagine you’ve ruled out the option of it being a hydraulic related problem. Thus, the issue is connected to the electric power steering (EPS), so if this occurs then it’s due to the electric assist appliance not responding. What Should You Do? Finding the source of the electrical problem with the power steering can be difficult if you don’t have a code reader or a device that scans for the issue. Follow a routine to get to the bottom of the problem, by first searching for a fault with the connections and wires in your fuse box, and then moving on to check your battery’s voltage. If everything seems fine, then try this classic trick; turn your car off and on again! This might seem silly when dealing with the complex electrical systems of a car, but it should reset all the electrical parts and your EPS could be up and running again. However, if it works, you should only think of it as a temporary solution and have a think about getting your EPS system thoroughly investigated, to ensure everything is in working order. Are you having a read of these problems and gnawing away at your fingernails, because one problem seems a little too familiar? Well, there’s no need to be anxious, as long as you think that you may be facing a power steering system issue, we’ll do the rest for you. At Power Steering Services, we have the skills to diagnose and fix any faults you may have with your power steering quickly and effectively! Tags : Common Power Steering Problems & Solutions, How To Spot Power Steering Issues, How To Spot Power Steering Problems, Hydraulic System, Power Steering Failure, Power Steering Faults, Power Steering Issues, Power Steering Problems, Power Steering System. ← Common Suspension Problems & How To Spot Them!